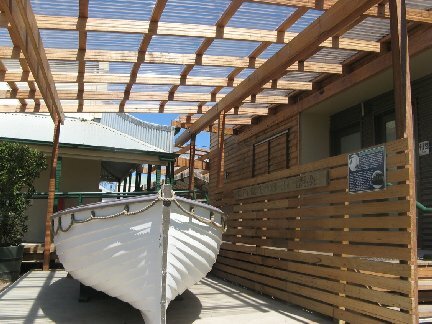 The award winning PORT ALBERT MARITIME MUSEUM is situated on the Gippsland Coast, east of Melbourne. 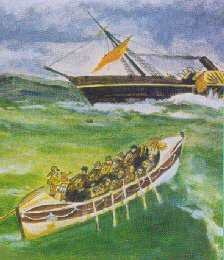 Historic Port Albert was settled in 1841 following the wreck of the paddle steamer Clonmel, and the arrival of Angus McMillan, seeking a port for shipping cattle from the lush hinterland. The museum opened in 1976. Significant items dealing with Gippsland's maritime history are housed in the 1861 Bank of Victoria building and in the John Irving Archives in the adjacent former CBC bank office. Port Albert was the original Port of Entry for the Gippsland Gold Fields and the old bank vault houses a display on Gippsland Gold Discovery. 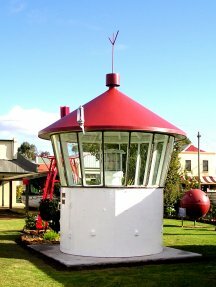 In the entrance room is the 400kg, 1.3m high drum lens from the Cape Liptrap lighthouse, the Cliffy Island cannon; and the story of the Bass Strait lighthouses is told in the display on "The Mailmen of Bass Strait". The growth and decline of Port Albert's fishing fleet is outlined in the fishing room display on "The Sharkers of Port Albert". There is also a comprehensive shell collection and the Chinaman's Point diorama and information boards have the findings of a recent archaeological dig at the site of the 19th century Chinese fish curing industry at Port Albert. Left - The Fishing Room display. 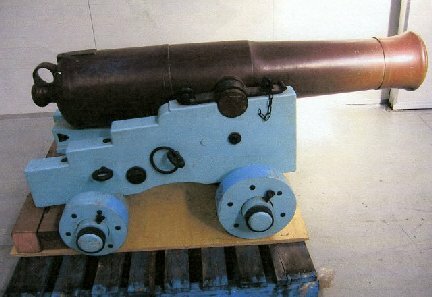 Right - Clliffy Island cannon on blue carriage. 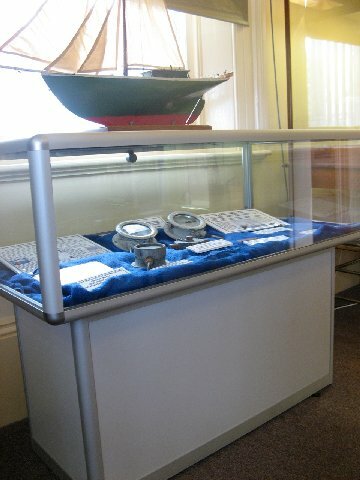 Click Award display case, with the Rainbow Warrior display. 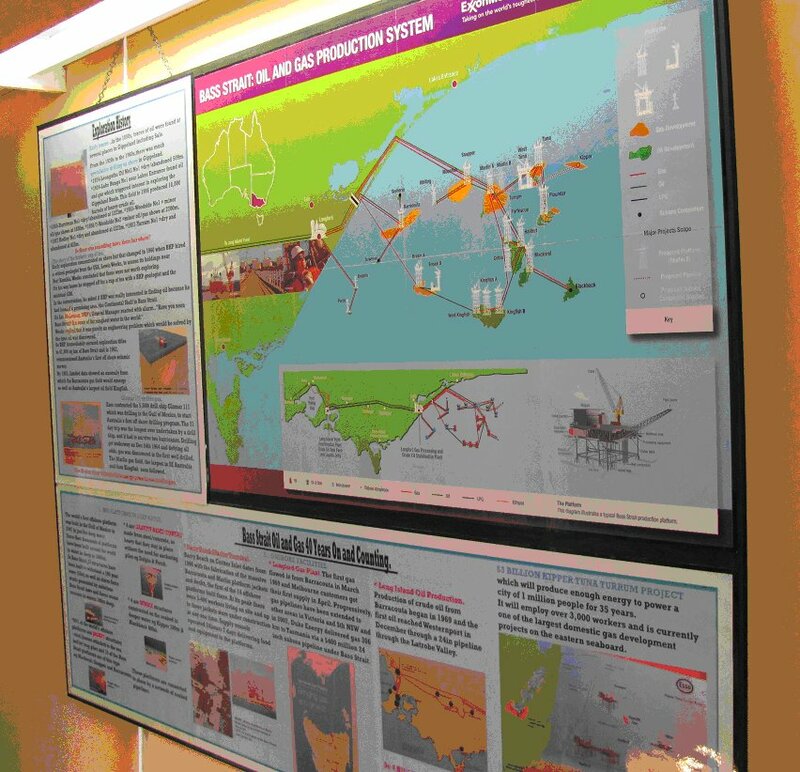 One of the latest displays celebrates 40 years of Bass Strait Oil and Gas exploitation with current information on the EssoMobil $3 billion Kipper Tuna Turrum project which will produce enough energy to power a city of 1 million for 35 years. the "Morning Star" and the evocative sounds of an overnight trip on the century old inlet fishing boat. As well as several giant anchors, the original Port Albert wharf crane and a mysterious moving boats mural, there is the restored Citadel Island lighthouse (right). This light was located on the top of a spectacular granite island off Wilsons Promontory and was the first automatic acetylene light installed by the Commonwealth Lighhouse Service in 1913. Port Albert lifeboat with Archives on the right. Citadel Island Lighthouse. Anchor. 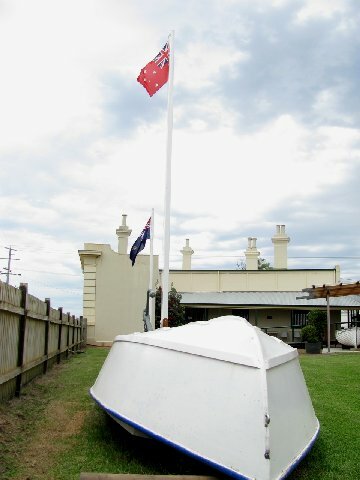 Outdoor display with dinghy and flagpole. The extensive Navigation and Communication exhibit traces the history from the day of the hand-held sextant to the latest satellite navigation aids. A pushbutton activated display of the original 1952 coastal radio base station, used to communicate with the fishing fleet, is a feature. 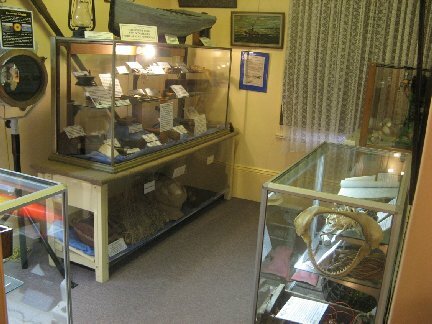 The museum also holds the only display of Omega Navigation base equipment in Australia. 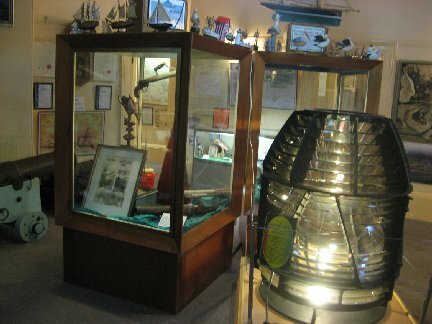 Display room with Cape Liptrap Light lens. A spectacular sound and light show in "Shipwreck Alley" features artefacts from the "Clonmel", one of the last wooden paddle steamers, wrecked in 1841 on a sandbar at the entrance to what is now known as Port Albert. There are also relics from the "Blackbird", Cambridge" and "Gulf of Carpentaria". On display is the Breeches Buoy 2 stage Rocket Lifesaving Equipment issued to Port Albert in 1871 which the Smithsonian Institute says is one of the few intact ones left in the world. . Unique records of early Port Albert and district, relating to trade and immigration, are available for bona fide research in the achives. There is a large collection of maps, charts, paintings and photographs, many of which are on permanent display. Primary and secondary source material includes Victorian Government Gazettes. Sketches on display include copies of the 1843 Russell Sketches of Port Albert, and an 1850 Dawson Map of the first survey in the area. The museum also has a number of excellent maritme books for sale, including the 2-volume biographical reference for Port Albert district, "Clonmel to Federation". In 2010 the Fred Hobson Archives were opened in their own specially constructed building. An Education Kit of over 100 pages of information and exercises is available for $30 collected ($35 posted) - one copy of the kit will be provided free to schools making their first booking. The kit contains a wide range of topics suitable for upper primary and secondary students which can be used at school and/or at the Museum. Qualified Museum staff are available to assist teachers during visits with guidance on activities at the Museum and for Port Albert based activities. A mail out of information with a selection of kit items and general planning advice is available from the Museum. Admission for school groups is $2.00 per student. Group concessions apply to groups of 20 or more. With prior notice, morning and afternoon teas available. 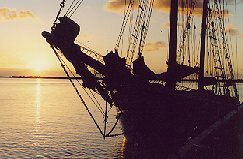 Group, coach and tour operators The Port Albert Maritime Museum is open daily from 1 September to 31 May inclusive, 10.00am - 4.00pm. From 1 June to 31 August it is open only on weekends, public holidays and school holidays, 10.00am - 4.00pm. Coaches by appointment. For openings at other times, contact the museum on (03) 5183 2520. Wheelchair access is available to all areas. There are five options available for further tours beyond the museum, to other historic sites. Link here for further information. Port Albert is off the South Gippsland Highway (C452), east of Wilsons Promontory. If coming from Melbourne, take the South Gippsland Highway; or the Princes Highway and turn south at Traralgon for Yarram and then Port Albert. From Sale, take the South Gippsland Highway to Yarram and then on to Port Albert. * 1998 Museum Industry Recognition Award for Museum Excellence. * 1998 Gippsland-Wellington Tourism Award-Heritage Section. * 1998 Received M.A.P full accreditation making it the first Maritime Museum in Victoria with ....Accreditation. * 1999 Museum Conservation Award. * 2000 Gippsland Disability Resource Council Access Award. * 2001 Wellington Council Community Event Award for the Gold Exhibition. * 21010 Museums Australia (Vic) Award for the best Victorian volunteer-run museum. * 2010 Victorian Finalist in the ABC Radio National Regional Museums Award. 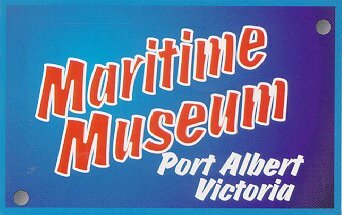 Port Albert Maritime Museum Inc, is an incorporated Committee of Management of the Wellington Shire Council, 28 April 1999. Some members hold Tourism 11 Certificates through Tourism T.A.F.E. Course and are with prior notice, available as local tour guides. Contact phone numbers: Museum: (03) 5183 2520. Committee: Carol Hobson, Venetia Beaney, Carol Kavanagh, Kaye Neilson, Alison Vardy, Bill Black, Esme Rash, Peter Bland, Bruce Green. Yarram and Port Albert Homepage. Hosted by Oceans Enterprises, Yarram.